Currency, leads, conversion rates– business performance is a game of numbers. To stay ahead of the competition, it is vital to measuring those numbers daily. Organizations using platforms like Salesforce and HubSpot have the luxury of running reports with little to no grunt work. But communicating those reports via visual communication mediums, like digital signage, hasn’t been simple in the past. Let’s be honest: the last thing anyone on staff wants to do is convert .csv files into graphs, then into content for digital signage, each day. 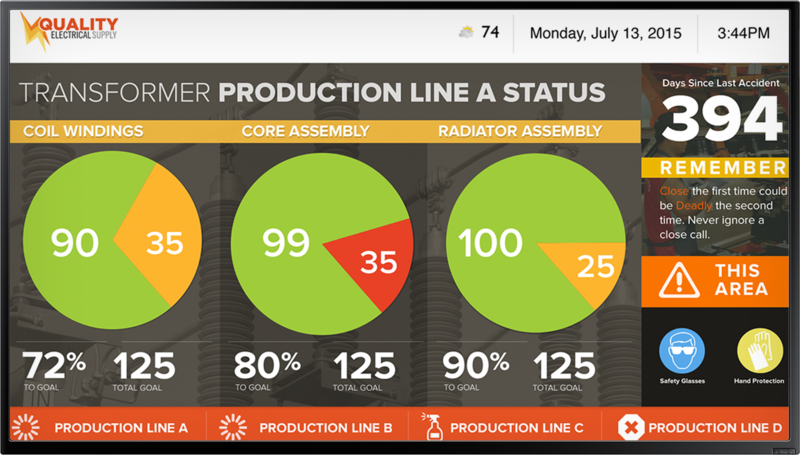 Now users can automate data visualization with digital signage software. Visual perception, handled by the visual cortex located in the rear of the brain, is extremely fast and efficient. We see immediately, with little effort. Thinking (i.e. cognition), handled primarily by the cerebral cortex in the front of the brain, is much slower and less efficient. Data visualization is effective because it shifts the balance between perception and cognition to take fuller advantage of the brain’s abilities. Employees will usually glance over a report once a day to check their numbers; while super competitive employees might check them a few times. In both situations, the process disrupts their natural workflow. Instead of emailing a client or fully engaging them with a phone call, they’re fumbling around in a spreadsheet to see who has the most sales for the month. With data visualization, the numbers are displayed as easily-digestible images. Therefore, it takes no time for employees to check their progress reports. Long story short: Seeing the bigger picture is more effective than looking at numbers. This concept goes back centuries, with the invention of charts and graphs. When was the last time you saw a pie chart? Probably within the hour. We use pie charts and bar graphs all the time because they are universally understood. For a sales report: Jim has the biggest slice of pie = he’s made the most sales this month. Data visualization can draw attention to problem areas faster than a spreadsheet. A bar chart or line graph is the perfect visual when numbers are reaching critical levels. A quick glance makes it obvious that improvements and changes must be made. When customer satisfaction survey responses are averaging at a 1 out of 10, the customer service department is due for an audit. Over time, one campaign or product might outperform the others. Why? Well, with data visualization the trends should be easy to assess. Perhaps a social post went viral during the product launch, or the product was picked up by a brand advocate. October might have been a fluke for leads, but November made up for it. Noticing these ebbs and flows in business performance is much easier through data visualization. Digital signage is a medium that is commonly used in organizations to display corporate messages and company-wide reminders. With simple software integrations, this visual tool can also transmit the data reports from platforms like Salesforce. Without adding any work to anyone’s plate, graphs and charts with sales and marketing data can adorn the signs with updated information multiple times a day. Data visualization simplifies reporting for organizations. Taking the information employees need to see each day and automating it to a visual medium like digital signage is a sure way to keep the organization in check. Employees are able to see the broad picture of their performance, are alerted of problem areas, and can track trends over time.